Take I-76 W toward Valley Forge. Merge onto I-476 N via exit # 331B toward Plymouth Meeting. Merge onto US-22 E via exit # 56 toward PA-309 / I-78E/ Allentown. Take the exit toward PA-611 / 4th St. Turn LEFT onto PA-248 / Bushkill St. Turn LEFT onto N. 3rd St. (N. 3rd St. becomes College Avenue). Turn LEFT onto Cattell Street. Turn SLIGHT LEFT onto Knox Ave. (Knox Ave. becomes Sullivan Trail). Forks Township Municipal Complex will be on the LEFT, after light at Giant. Take PA-33 S. Take the PA-191 exit toward Stockertown/Nazareth. Turn LEFT onto Industrial Blvd / PA191 N. Turn RIGHT onto Main St./Stockertown/Rte. 115. Turn SLIGHT LEFT onto E. Center St. (E. Center St. becomes Sullivan Trail). 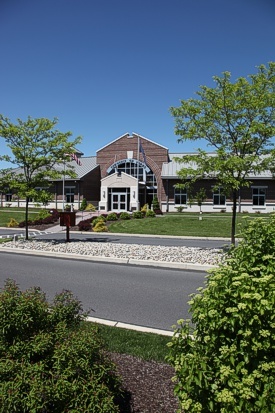 Forks Township Municipal Complex will be on the RIGHT at emergency blinker light. Take 22 E. toward Bethlehem. Take the exit toward PA-611 / 4th St. Turn LEFT onto PA-248 / Bushkill St. Turn LEFT onto N. 3rd St. (N. 3rd St. becomes College Ave). Turn LEFT onto Cattell St. Turn SLIGHT LEFT onto Knox Ave. (Knox Avenue becomes Sullivan Trail). Forks Township Municipal Complex will be on the LEFT, after light at Giant. From the circle in downtown Easton, take the N. 3rd St. exit from the roundabout. (N. 3rd St. becomes College Ave). Turn LEFT onto Cattell St. Turn SLIGHT LEFT onto Knox Ave. (Knox Ave. becomes Sullivan Trail). Forks Township Municipal Complex will be on the LEFT, after light at Giant. Click HERE to get driving directions. A new window will open. Mouse over the push pin to see all options. 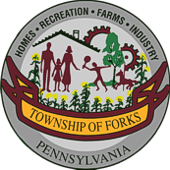 Close the current window to return back to the Forks Township website.